The article, published online on Wednesday, listed 20 eligible singles of varying genders and orientations who had been nominated by readers. Graham was not mentioned in the piece at all, although President Donald Trump rated two mentions from the highlighted singles — one of whom told interested readers that Trump-voters need not apply. 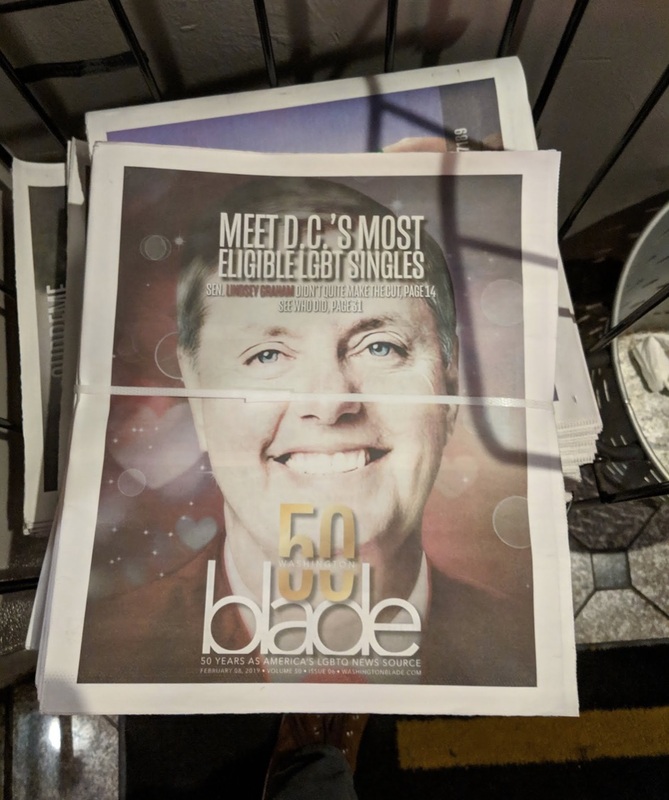 The paper promoted the article on Twitter several times, and Graham’s face did not appear in that photo either — instead, it showed a collage of photos of the eligible singles. But the actual papers that circulated on the streets of Washington, D.C. had a very different look. There was a sub-headline that read, “Sen. Lindsey Graham didn’t quite make the cut,” but did not clarify that the article about Graham was completely unrelated to the article about the eligible singles. In that article, author James Wellemeyer asked whether or not it’s ethical to “out” politicians — and appeared to land on the position that, as long as the person has “done no harm” to the LGBT community, it’s probably not very nice to “out” them as a political tactic. Outing as a political tactic and as a general practice remain controversial. Most agree that revealing the sexual orientation of an individual who has done no harm to the LGBT community is unethical. In some cases, outing can even subject LGBT people to physical danger. However, his ethics appeared to take a hard left when it came to people who don’t offer political support for LGBT issues. “But the question becomes more complicated when the discussion centers on powerful politicians who have pushed anti-gay agendas,” he said. No one on the left is disparaging Lindsey Graham for whatever his lifestyle choices are. But recent behavior raises the question of motive. If he’s been compromised because of personal choices he’s ashamed of & therefore is taking actions that undermine our laws, we need to know. Lindsay Graham says he’s going to investigate Hillary if he becomes Judiciary Chair. Graham’s recent erratic behavior with regards to Trump suggests that he’s personally compromised in some way. Perhaps we should have an investigation of that as well. Not getting enough attention for its impact during Barr and what’s next: Grassley quietly stepped down as chair of the Senate Judiciary Committee, and Trump extreme loyalist Lindsey Graham, who many believe is compromised, stepped in. I can’t even imagine what they have on Graham. Freshman Democratic Minnesota Rep. Ilhan Omar also tweeted her concern that Graham was compromised — and struggled to defend the tweet during a CNN interview. Neither Graham’s office nor the Washington Blade responded to requests for comment at the time of publication.